“May our lives and the lives of all beings be pervaded with goodness. This is Amma’s prayer on this occasion. 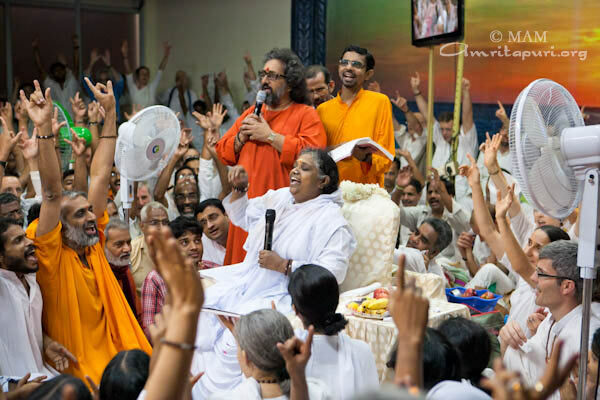 May the divine power to effect positive change – both in ourselves and in the world – awaken in Amma’s children. Amma’s prayer is that this New Year may lead to the birth of a new individual and a new society. “New Year is an auspicious moment wherein people try to correct all the mistakes they made the previous year and try to overcome their laziness. Interest in and enthusiasm for a new beginning is awaken. Many make New Year’s resolutions. They try to start new habits. Many begin keeping a diary. However, if we look at that diary six months later, we will see that entries were made only for the first two weeks – maximum, three months. This is what we see in many people’s lives. We don’t have the ability to persist with good things. Sustained efforts are always appreciated. For example, someone who has served the army or any other organization for many years is always honored by that organization. But we don’t persevere with our good actions and promises. Many start doing yoga, but then, two or three days later, they quit. Many children start practicing meditation with a lot of enthusiasm, but after a couple months they stop. “We should not delay in doing good actions. Our mind is constantly changing. We need constant awareness and conscious effort to speak good words, perform good actions, and to practice patience and compassion. Such actions slowly turn into habits, which eventually become spontaneous. Such habits bring success in life. “Human beings have been given total freedom to write what they wish upon the pages of life. God has given us the pen and paper, but He will never tell us what to write. He will only show us how to write. He will keep giving us hints. He has left what we write on the pages of life up to us. We have the freedom. If we want, we can write letters of goodness, love and beauty. We can also write letters of evil hatred, and ugliness. God will keep giving us hints regarding the respective results of goodness and evil. During the course of 2011, humanity has received so many such hints. “Natural disaster, social conflicts and economic crises are spoiling the sleep of countless people throughout the world. Fear and anxiety are hunting the minds of humanity with more and more intensity every day. Because of humanity’s indiscriminate actions, Nature has lost its harmony. The air, the water and earth have become full of poison. Nature – which was once like a kamadhenu, the wish-fulfilling cow-has dried up. The oil supply is rapidly decreasing. The food supply is dwindling. Potable water and pure air are becoming scarce. Where did we go wrong? The real mistake we committed lays in our inability to differentiate between requirements and luxuries. “If our current generation could reinstate such an awareness of Dharma, then poverty and starvation would vanish like a bad dream. “The New Year reminds us about the flow of time. Just as water drips, drop by drop, out of a cracked vessel, so too is our lifespan diminishing, minute by minute. As human beings, the most precious treasure we have in this world is time. Anything lost can be found again-except for time. Understanding this, we should live with awareness, every moment. We should also remember that each tick of the clock is really a footstep of Death, who is coming closer every moment. “Whatever we see, hear or experience in the world is ephemeral. We need to find the eternal substratum of everything, which is the Atma. Then we will understand that no one in this world is different from us. “Whether we laugh or cry, the days are going to pass by nonetheless. So why didn’t we choose to laugh? Laughter is the music of the soul. We should not laugh, seeing the faults in others. Let us see good in everyone and share good thoughts, words and actions. Let us also try to laugh, seeing our shortcomings and drawbacks. 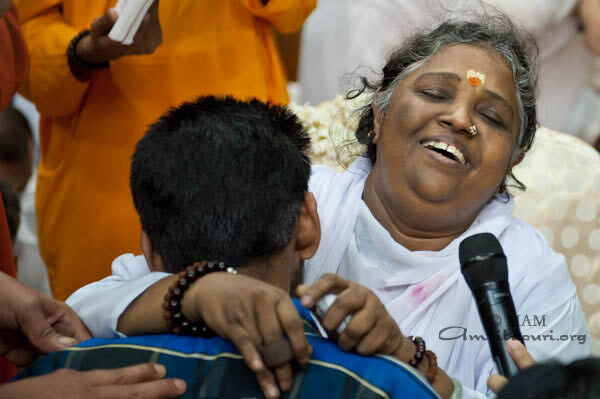 “Many children tell Amma that the world is going to end in 2012. Amma doesn’t feel this will happen. There may be some incidents in some parts of the world. If we look at the earth, if we look at the water, if we look at the air, if we look at Nature, if we look at human beings, we can see that all in a state of agitation. This agitation is bound to echo like thunder somewhere in the world in one form or another. Anyway, death is an inevitable part of life. It can happen anytime, anywhere. But just as we start writing a new sentence after making the period mark, so too the end of one life just marks the beginning of another. But we should not live in fear. Instead, we need to cultivate the attitude of acceptance. Our attitude should be “Whatever happens I will remain strong, courageous and happy.” Living in fear is like lying on top of a bomb; we will never be able to sleep peacefully. But again, Amma does not see anything very serious happening. Tragedies are always taking place everywhere in the world. Even today, don’t we see accidents while we are travelling? Don’t we hear about airplane crashes? Floods, earthquakes, cyclones and tsunamis are regularly occurring. Wherever we may be, let us be happy and develop faith in the True Self. Let us perform good actions. “Worms take birth, procreate and die. Animals do the same. If human beings also live like this what then is the difference between us and other beings? What message do we leave for the world? Through their selfless actions, mahatmas live forever. Even if we are unable to contribute to the extent they do, let us try at least a little but to see what we can do for others. Even if just one tree is able to grow in a desert, at least that much shade is created. If just one flower blossoms, at least there is that much beauty. We may not be able to read under the light of a zero-watt bulb, but when a number of such bulbs shine together, we will be able to properly see. Similarly, through unity we can achieve so much. The world is like a lake that cannot be cleaned by just one person. However, if everyone does his part, we can clean it together. Let us not be lazy. Let us try to do what we can. In this way, we will definitely achieve what we need to. 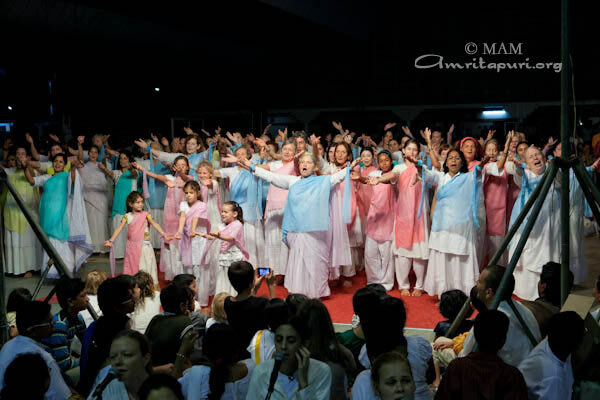 New Year’s Eve was celebrated in Amritapuri. Remnants of Cyclone Thane had drenched the Ashram with heavy rains from early morning through midday. But by dinner, the rains had subsided. Amma arrived for darshan at 11am. 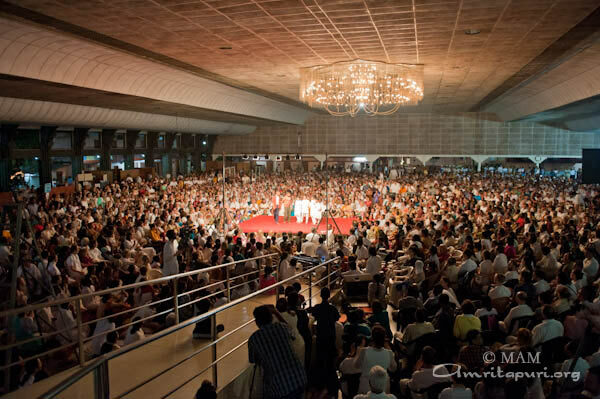 At about 9pm, the cultural performances began while Amma was still giving darshan on stage. 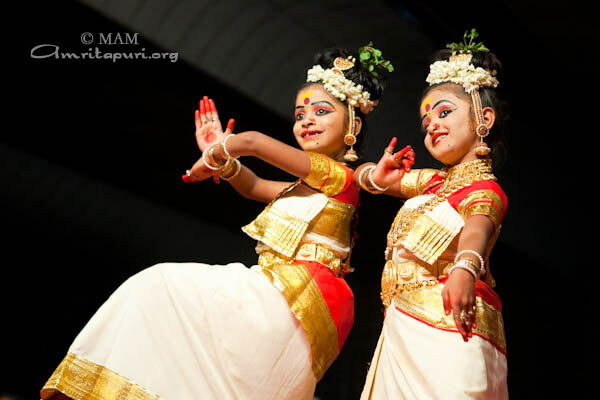 First was a wonderful Indian dance by two young girls of about 8 yrs old. They were followed by a French boy who was juggling an hour-glass shaped object on a string tied to two sticks held in each hand. 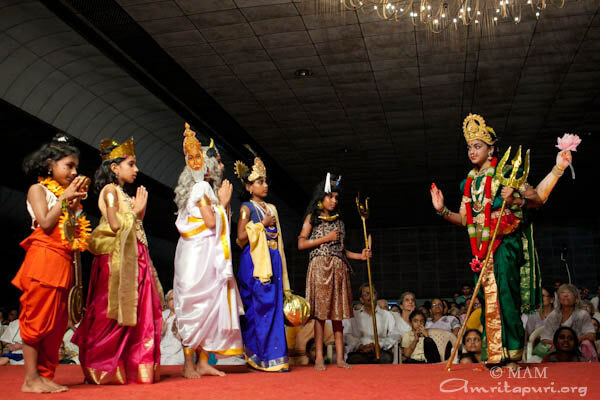 Indian resident children next put on a play based on Amma’s teachings. Amrita University students came next, entertaining the crowd with bhajans. The last performance was a colorful dance performed by women from around the world. After the talk, Amma asked everyone to chant Lokah Samastah Sukinau Bhavantu 18 times. 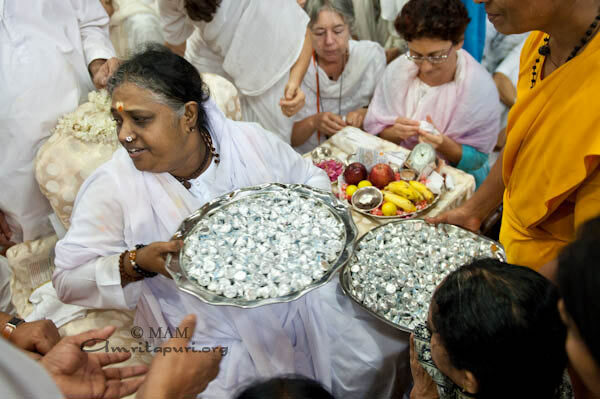 Amma then blessed full bowls of Hershey Kisses and told everyone to take just one. As darshan appeared to be ending, the musicians who had been playing for the performances started to play Bara Gopala Bala. 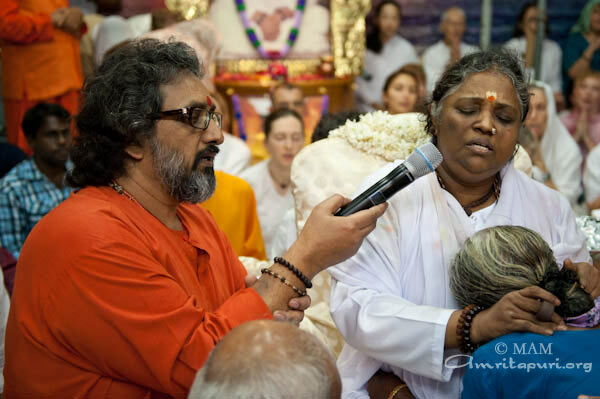 Amma took the microphone and began singing. Within moments, small circles of dancers had formed at the base of the stage: boys on the left, girls on the right. Jumping up and down, hands waiving in the air, their ecstatic joy was catching. 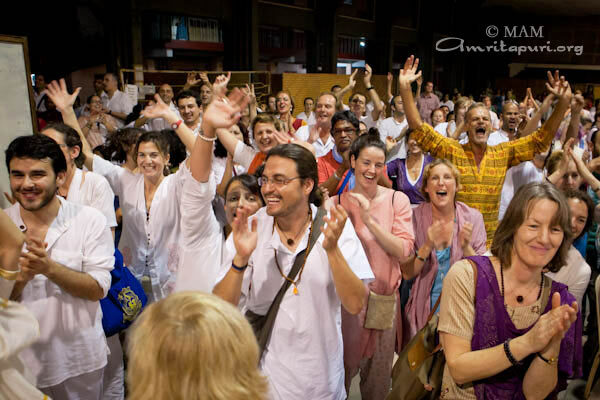 Throughout the hall, more people began dancing, inspired by Amma’s voice and the increasing rhythm. This continued for some time until the music eventually subsided. Then, much to everyone’s joy, Amma started singing Mata Rani. Within an instant, those who were still in their seats rose to their feet and joined in the dance. On and on it went with the hall erupting in Ki Jai!! !s over and over again until the roof was nearly blown off the hall. So much joy was there. After the Ki Jai!! !s subsided, Amma asked everyone to pray for peace and happiness in the world. Amma began singing Kushiyom Ki Bahar – the English translation appearing on the big screens in the hall. What had been joy and elation turned to solemnity as everyone repeated ‘Lokah Samastah Sukinau Bhavantu’ at the end. Silence descended over the crowd. Everyone was left to reflect on Amma’s New Year’s message, the sweet taste of chocolate, and the wish for all beings in all worlds to be happy.